Sign o' the times, I guess. 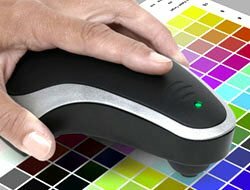 On the good side, I've received a review copy of ColorVision by Datacolor's PrintFIX PRO Suite, which consists of its latest Spyder monitor calibration device and software, and the Datacolor 1005 USB Spectrocolorimeter. The two of them together constitute the cheapest good closed-loop print calibration system—that I know of, anyway. My review of it will appear on Imaging Resource. I'll post the link, as soon as one exists. So, what are the other four? Mike, about the 30mm f1.4 I too have wondered in general; where are the fast primes for digital? Then I got to thinking that most of the lens mounts for DSLR's are hold overs from std 35mm SLR's with about 45 or 46mm lens flange to sensor distance. Even Olympus E system must be close to 43mm . This would make fast normal to slightly wide primes retrofocus designs, IOW big, fat, and expensive. But oh, wouldn't it be sweet to have a four thirds RF camera about the size of a Olympus RC with a 17mm f1.4....well I can dream can't I? Uh, at least in Europe I've seen the Sigma lens in stores for months now. An acquaintance of mine owns one. Hard to call that vapor, really. It's true that new PowerMacs are not out yet. But they have not been really released either -- Apple has only said that their entire computer product line will be Intel-based in June(IIRC). I wouldn't call it vapor either until in September or so. How about some (real) Carl Zeiss primes for your Sony/Minolta camera? You've seen the Sigma 30mm in Canon, Nikon, and Sigma mounts. It was annouced in K-M and PK mounts around Feb. 23rd, and those are the ones that have not yet materialized. Not a problem. I probably should have written out "Konica-Minolta."